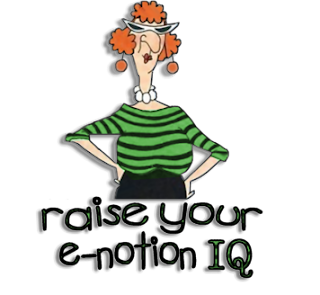 It's Wednesday and this week....I actually know it is Wednesday....that is such a great thing!!! 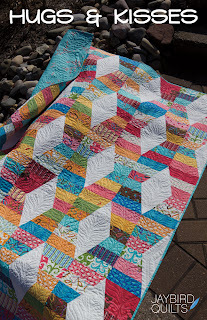 It just so happens I was able to combine my visit with Joan Hawley, Lazy Girl Designs, and Julie Herman, Jaybird Quilts, with the ruler I want to review. All thanks to Checker Distributor Open House. This sweet friendly face belongs to none other than that Lazy Girl herself, Joan Hawley. She is holding the Lazy Angle Ruler she designed for Creative Grids. The reason I wanted to review this ruler is because I'm one who does not like to have a "one wheel wonda" ruler (what I call a one purpose notion) they seem to be a waste of space. The Lazy Angle Ruler is definitely no "one wheel wonda" and thanks to Joan's demo blocks....I don't even have to make these up for my post....she did all my work for me. Now who is the Lazy one? 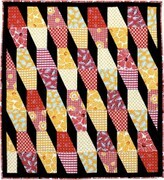 This is the Lazy Angle Ruler and I've been using it for my Hugs and Kisses Quilt (Julie Herman's Pattern). This is Julie's version of Hugs and Kisses above and mine is below. I am using a Bali Pop and joining the strips for mine. You saw the templates Joan used in the video. 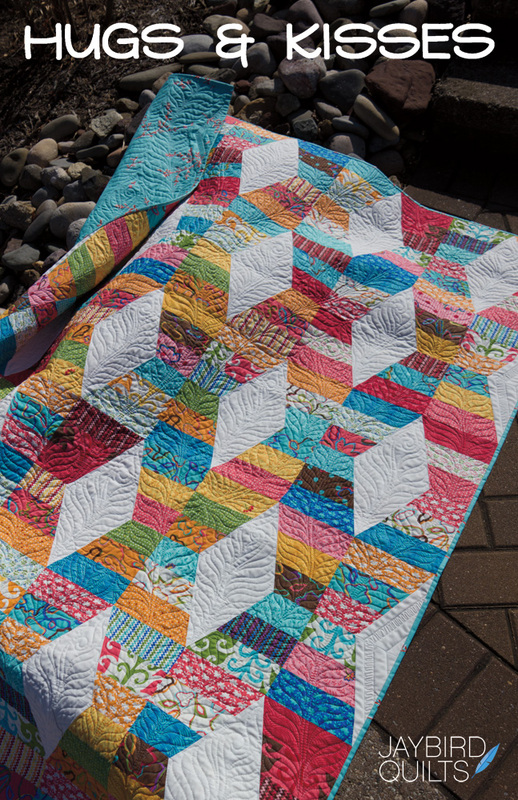 Below you can see other templates that show how you can join any side seamed block (of the same size) making a huge variety of quilt patterns. Strips left over? Here you go! I think the designs you can make with this ruler are only limited by your willingness to play ...or if you are like me and want to buy the pattern....between Joan and Julie there are at least 14 patterns you can choose from. I hope you have enjoyed this post as much as I have enjoyed writing it! The winner of Just Around The Corner by Kari Carr is Karen. Congratulations Karen!!! I have been knee deep in my Power Suit Challenge art quilt and actually forgot to post yesterday....so without further ado....back to Checker's Open House. Edyta Sitar, Laundry Basket Quilts, was as beautiful and pleasant as always during the Open House. She has a new book coming out, Reasons for Quilts. She had a few copies and they sold out fast!! Edyta's designs are timeless and I think that is why so many of her patterns and books appeal to so many quilters. I have been fortunate enough to hear Edyta speak on a few occasions and one of the reasons I really enjoy her lectures is because she focuses on relationships and events as themes for her quilts. 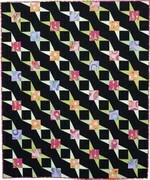 Friendship Triangles and Friendship Strips and Scraps are a great example of relationship quilting because quilters are encouraged to share triangles, strips and scraps to make quilts with those swapped fabrics. Shelly Stokes, Cedar Canyon Textiles, came in from Minnesota (you have to say that with the accent :) and she brought with her some fun rubbing plates, stencils and of course Paintstiks. Paintstiks are so much fun...and believe it or not...easy to use. Since I don't' draw, stencils and rubbing plates give me a boost for creating fun and interesting patterns on fabric. I bet you are wondering why on earth there is a vegetable peeler in this photo. The peeler works great for taking off the outer seal on the Paintsticks. I love the sunflower quilt Shelly had hanging in her booth....check it out.....isn't it beautiful, bright and cheerful? Nick Coman, Dragonfly Threads, had some fun and colorful....or should I say "de-colorful" inks to share at the Checker Open House. Unfortunately I was so focused on the Handi-Iron he brought from Kandi Corp that I did not even take his photo....how rude is that? Sorry Nick!!! Nick co-authored, Fabric Color Magic, with Abby Riba and it is one very cool book if I don't say so myself. 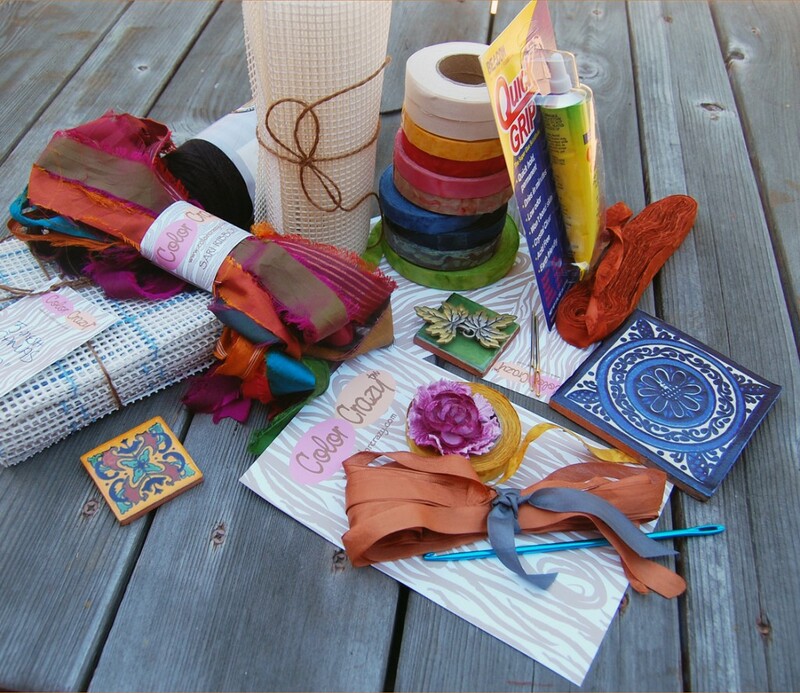 The book is about stamping, stenciling and brushing on fabrics. Lots of photos and step by step instructions so even a beginner can actually complete the projects. This is de-Colourant and Nick explained exactly how it works. I had read about de-Colourant in magazines and still didn't understand exactly what it is used for. Here you can see Nick had used a stencil and made a leaf on this black fabric. The color was dull until he heat set it and then it really popped nicely. Do you know what de-Colourant does? Get this....it removes/de-colors the pigment in the fabric and replaces the area with ink and the ink is colored. If you are like me you are thinking....what is the difference between that and fabric paint or Paintstiks...right? The difference is you don't feel any thing at all on the fabric. It is like the batik fabrics where you don't feel the designs....they are just part of the fabric. Cool ay? I think so. Look how pretty this notebook cover is....some de-Colourant, thread and a few beads and now Nick has one spanky notebook/journal. Nick gave me a pretty good explanation and education during the Open House. He and Shelly Stokes from Cedar Canyon Textiles were using some of the same stencils and collaborating which I think is really neat. 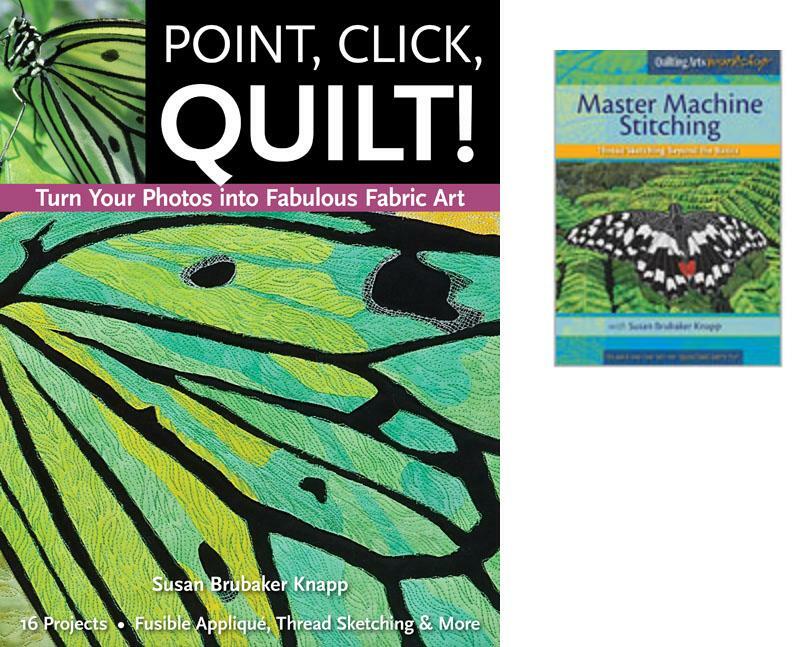 There were lots and lots of comments from very excited readers wanting to win Susan Brubaker Knapp's latest book, Point, Click, Quilt! 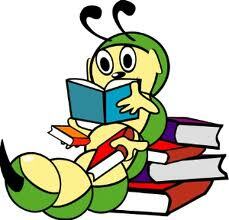 If you didn't win....don't stop reading....everyone wins today! BETH...Congratulations Beth!! Please e-mail me at IHaveANotion@yahoo.com with your full address and Susan will ship your book as soon as she is back home (she is traveling this weekend). For all of you who are laughing at my actual picture of my computer screen....I tried 4 or 5 different ways to print screen, cut-paste-save-save as- you name it and I couldn't get the comment to appear so I just beat blogger with my digital camera!!! 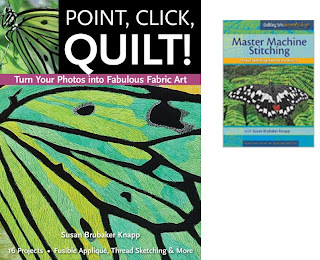 You can now order Susan's brand new book, POINT, CLICK, QUILT! 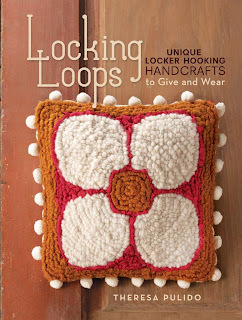 and her latest DVD, Master Machine Stitching at a great savings! Click here to find out more :) If you are serious about learning how Susan creates such amazing art quilts....this is your chance to find out how she does it and learn to make some of your own. It's All "Just Around the Corner"
Today I get to tell you about visiting with Kari Carr at the Checker Distributor Open House last Sunday. 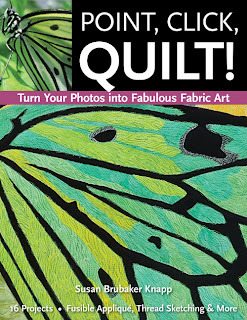 You know I was thrilled to be able to take photos of the quilts Kari has made for her new book, Just Around The Corner. I had just received the book for review from Martingale & Co., perfect timing! I had just read Kari's latest book, Just Around The Corner, Quilts with Easy Mitered Borders, so I was excited to see her pillow and purse with my own eyes. What really grabs me about Kari's mitered borders is the variation of fabric colors in the mitering. Can you see what I'm talking about? Look at the bottom of the pillow above. See the fabric that is pulled back? It has the brown paisley and on the sides....you see the pink solid over the brown paisley. The design in the center is fun enough....but with that mitered border...I think this pillow goes from "nice pillow" to "an eye grabber." Very zippy indeed! I find it very difficult to find a purse pattern that I will actually carry. I'm very conservative when it comes to handbags...I don't want them screaming from the roof tops (quilts are another story all together). This bag is actually a bag I would carry....choosing my own conservative fabrics of course. The pattern and directions are in Just Around The Corner....along with the pillow pattern and 7 other projects. Kari also is the inventor of the Clearly Perfect Angles template you see here in the photo. She uses it in her book but you don't have to have it to make the projects in Just Around The Corner. 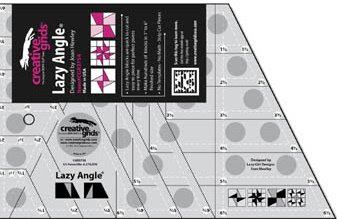 The Clearly Perfect Angles Template is a soft flexible template that clings to acrylic sewing tables. It is easy to peal back and reposition if you are taking your sewing machine for a walk (just checking to see if you are still reading...:). There is a 1/4 inch and 5/8 inch seam guide along with the angles for be able to sew accurate 45 degree angles for triangles, flying geese, snow balls and mitering bindings etc. Since Kari was demonstrating at Checker's Open House....I took advantage of taking a few photos even though my main focus was on her new book. So what do you think? Do you like what you see? I want to know what all of you are thinking about Cari's new book, Just Around The Corner. If you are kind enough to leave me a comment....I'll choose one very lucky IHAN blog follower on Wednesday August 31st to receive my copy of Just Around The Corner. If you can't wait....no worries....you can order the book now at IHAN and save money....until the end of Aug. only.